"Ground beef, fresh onion, green bell pepper, tomatoes and rice are simmered in a sweet-hot sauce of chile, brown sugar, cumin and Worcestershire. This savory rice dish is then baked with Cheddar and garnished with fresh cilantro." Brown the ground beef in a large skillet over medium-high heat. Drain excess fat and transfer beef to a large pot over medium low heat.. Stir in the onion, green bell pepper, tomatoes, water, rice, chile sauce, salt, brown sugar, cumin, Worcestershire sauce and ground black pepper. Let this simmer for about 30 minutes, stirring occasionally, then transport this to a 2-quart casserole dish. Press down firmly and sprinkle with the shredded Cheddar cheese. Bake at 375 degrees F (190 degrees C) for 10 to 15 minutes, or until cheese is melted and bubbly. Garnish with chopped fresh cilantro. 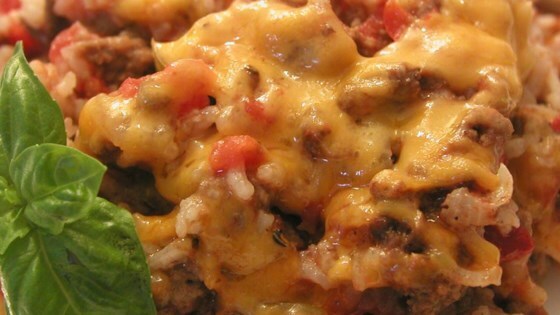 Easy rice casserole full of flavor! Great recipe that I make often!!! I use extra tomatoes instead of chili sauce and add cayenne pepper for a little kick.